Overview project-status and science-result iPoster, viewable every day in the poster sessions (official session is Wednesday evening), and online. We’ve completed a successful deployment of the Northern Evryscope. The system is currently undergoing commissioning. By Nicholas Law|October 27th, 2018|Categories: Uncategorized||Comments Off on Northern Evryscope deployed! 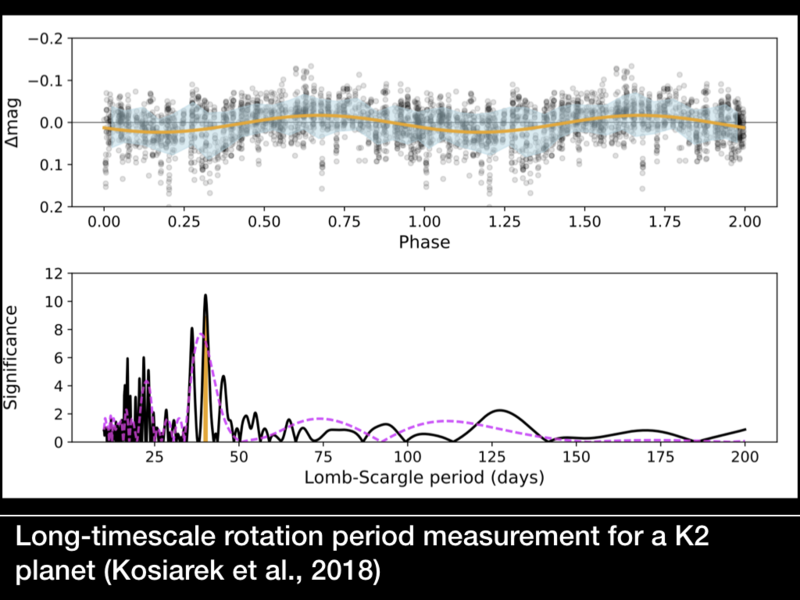 Evryscope measured the rotation period of K2-3, a planet-host with too long a rotation period to be measured directly in K2 (or eventually TESS) data. We’re happy to provide data for astronomers interested in similar measurements of other targets. 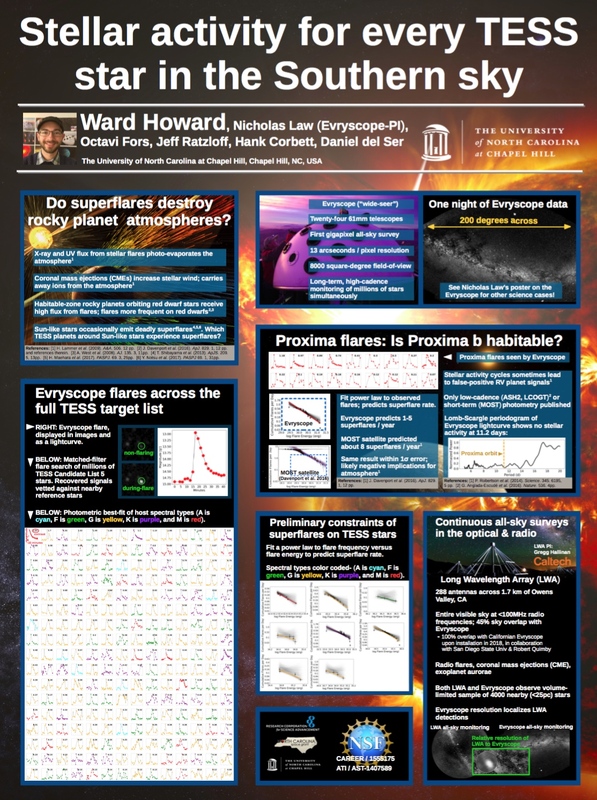 Astrobites has a superb writeup of the Proxima superflare, written by Daniel Berke @ Swinburne! The Evryscope has detected a superflare that briefly made the tiny star Proxima Centauri, the nearest star to our Sun, 70x brighter. Proxima b is a terrestrial-mass planet in the habitable-zone of Proxima Centauri. Proxima Centauri’s high stellar activity however casts doubt on the habitability of Proxima b: sufficiently bright and frequent flares may destroy the planet’s ozone layer, allowing lethal levels of UV flux to reach its surface. In March 2016, the Evryscope observed the first naked-eye-visible superflare detected from Proxima Centauri. Proxima increased in brightness by a factor of ~68 during the superflare, reaching a brightness just visible to the naked eye at dark sites (and easily seen with binoculars, if someone was looking in the right direction). It’s probably worth mentioning that some people on Twitter have misinterpreted our paper to suggest that we’re claiming this event would have been easily visible to most people at most sites — which it would not have been, and which don’t claim in the paper. We just use “naked-eye” as a compact way to say the event reached a brightness in visible-light that can be detected by the human eye without optical aids under ideal conditions, to give an idea of how bright it was compared to most astronomical events. Our statistics suggest that Proxima produces a superflare around five times a year — and some of those flares would be even brighter than the one we saw, perhaps even to the level that they could be easily visible to many people around the world. So there’s a (very) small chance that if you’re in the Southern Hemisphere and look up at Proxima Centauri, you could see a superflare going off! In our paper, we show that the repeated flaring is sufficient to reduce the ozone of an Earth-like atmosphere by 90% within five years. We estimate complete depletion occurs within several hundred kyr. 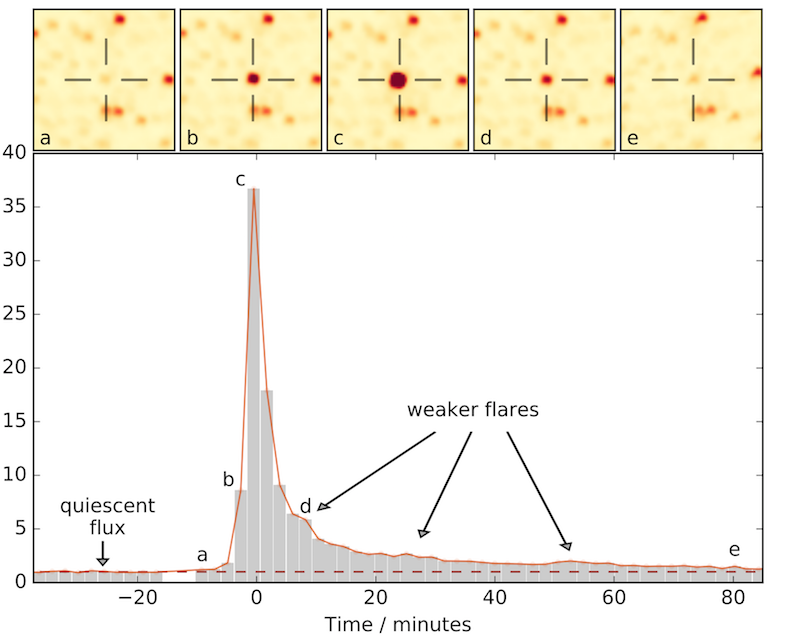 The UV light produced by the Evryscope superflare reached the surface with ~100x the intensity required to kill simple UV-hardy microorganisms, suggesting that life would struggle to survive in the areas of Proxima b exposed to these flares. Above: the Evryscope discovery of the first naked-eye superflare from Proxima Centauri. Proxima got 35x brighter in a single Evryscope two-minute exposure; over the shorter timescale of the human eye Proxima increased in brightness by a factor of ~70x. 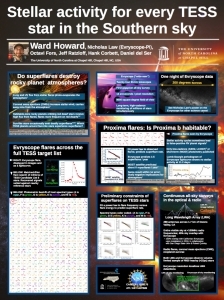 Two project update posters from the Know Thy Star, Know Thy Planet conference at Pasadena, including the first flare-rate and exoplanet habitability constraints from the Evryscope. An update on the Evryscope survey at the Keele Transiting Planets conference. 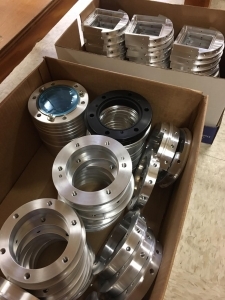 The first Evryscope-North parts have been completed at the UNC machine shop. With a couple of dozen cameras, there are a lot of components! 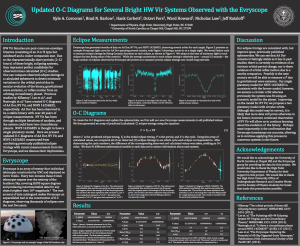 The Evryscope team and collaborators presented Evryscope flare-search results at the AAS Radio Exploration of Planetary Habitability in Palm Springs. Nick Law presented an informal IAS @ Princeton seminar about the Evryscope and Robo-AO, with updates on some of the results so far from our various science programs. The PDF version is here. We have started ordering the components of the Evryscope-North! The telescope will be based at the Mount Laguna Observatory (MLO). 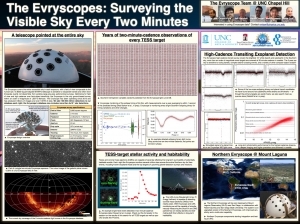 The Evryscope-North is funded by a collaboration of San Diego State University (SDSU), UNC-Chapel Hill and the Research Corporation Scialog program. 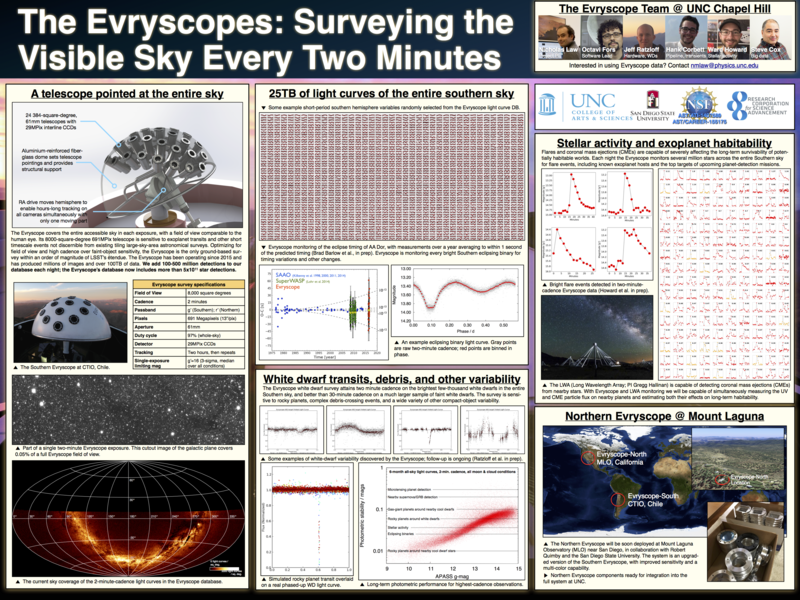 Together with Evryscope-South, Evryscope-North will provide all-sky monitoring of essentially every object brighter than 16th magnitude . 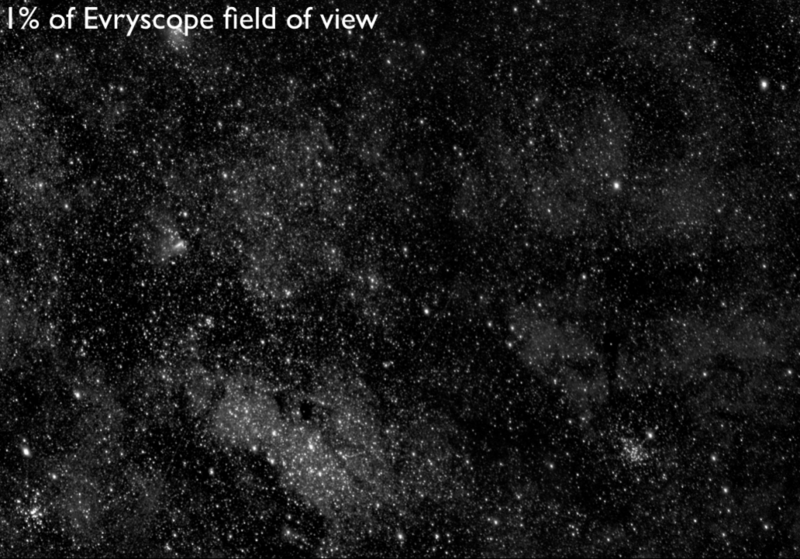 The two Evryscopes overlap in field of view, allowing truly-simultaneous multi-site multi-color observations over thousands of square degrees. 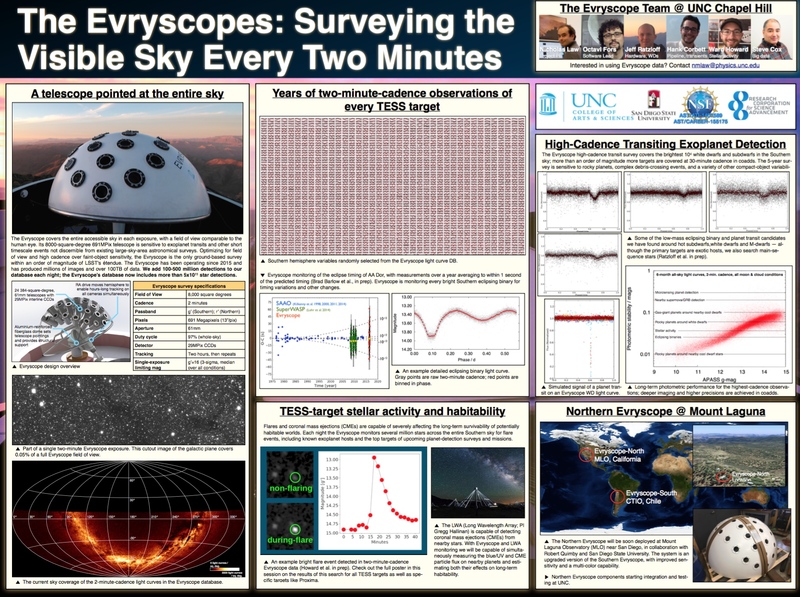 We expect to deploy the Evryscope-North at MLO in the summer of this year. We’ve added some updates on our current results and status to this page. 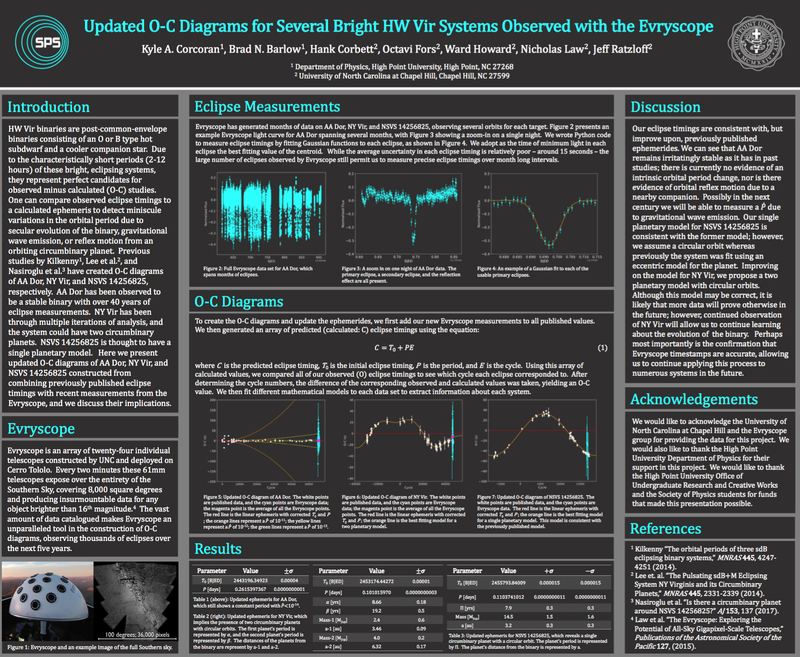 We are excited to present the Evryscope project at the AAVSO annual meeting, where Octavi Fors will discuss our Scialog-funded plans for amateur observers to follow-up Evryscope discoveries. 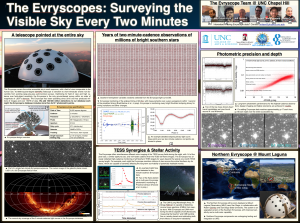 We’re presenting the Evryscope at an invited talk @ the SRK60: Compact, Cataclysmic and Catastrophic workshop, and two invited talks at the Scialog Fellows Conference. The Evryscope has been operational and fully robotic for one year, and has recorded over 60TB of data. All hardware is operational, and the system has survived lightning strikes, snowstorms and an 8th-magnitude earthquake without any damage! 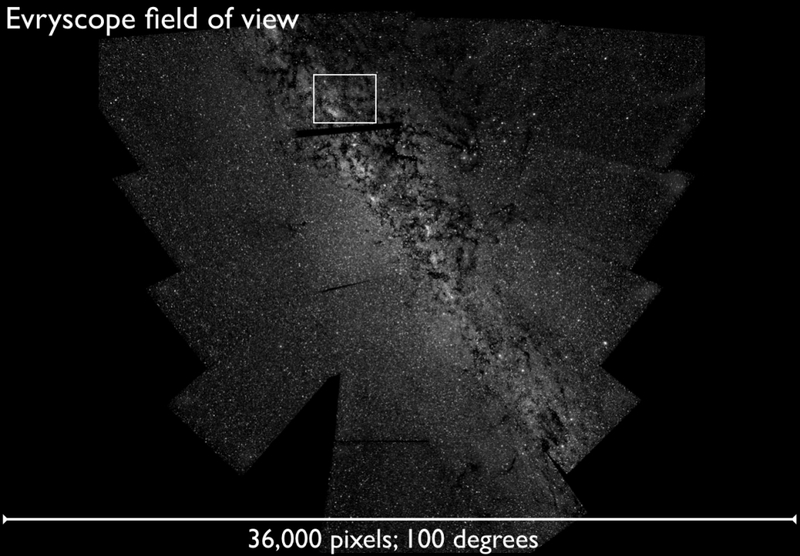 Our team is currently finishing-off our data analysis pipeline, which performs image calibration, astrometry, source extraction, light curve building and trend filtering. All results are inserted into our databases within the two minute time before the next exposure is taken, a data rate of 100Mb/sec. We expect to offer the first high-quality light curves to the general community by the end of 2016. Funding for the system is provided by the NSF/ATI and NSF/CAREER programs. Below is a full Evryscope image, stitched together from all cameras. A zoom into the white box in the image above. 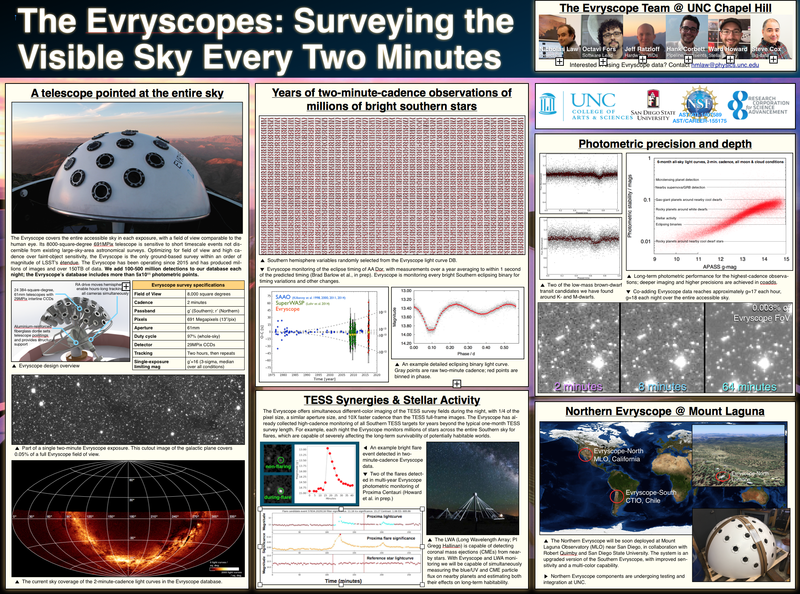 The NSF CAREER program has funded Evryscope operations for the next five years, including data analysis and pipeline development support!